Where are the Latin American Bill Gateses? The number of billionaires has soared in the past few years. Many of these “superstars” have amassed their fortunes very swiftly by creating companies that are much more innovative, productive and dynamic that the rest. 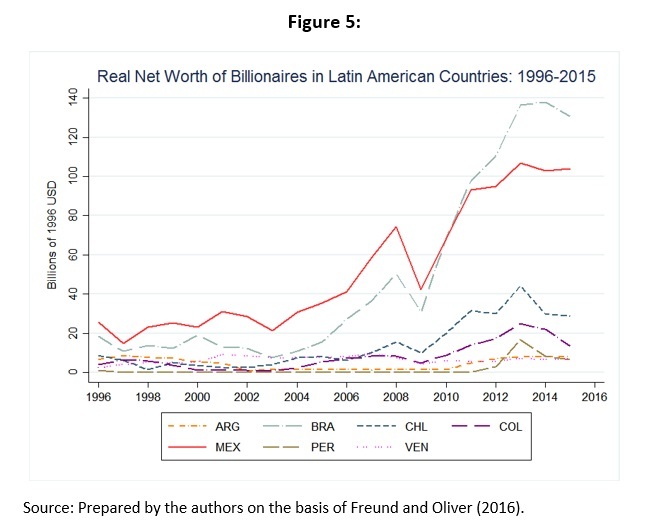 Latin America, however, appears not to have been swept up in the “billionaire boom”; nor has it witnessed the steep increase in inequality that has occurred in other parts of the world. In this post, we will review the empirical evidence and propose a preliminary explanation for why Latin America’s experience has differed from that of other world regions. Disparities in standards of living is a topic that has always been of great concern to economists. At first, the discussion centered around the reasons why some countries were rich and others poor and whether this per capita income gap was growing narrower or wider. In the last few decades, thanks to the possibility of compiling more accurate and more detailed statistics at the household and individual levels for a large number of countries, economists have begun to analyze the global distribution of income. They do so by directly comparing the incomes of all people in the world, rather than having to resort to the use of aggregates, such as per capita income, that mask the sharp differences in income that exist within national populations. The availability of data at the level of individuals makes it possible to disaggregate global income inequality into the portion that is attributable to cross-country differences and the portion that is accounted for by within-country differences. An historic analysis of the world income distribution shows that the level of inequality rose sharply throughout the nineteenth century and then continued to climb, but at a more moderate pace and with some ups and downs, during much of the twentieth century. However, this upward trend began to give way to a decline in inequality in the 1990s, and this downward trend has remained in evidence up to the present day. In other words, if we compare the income levels –adjusted for purchasing power– of everyone in the world (with no reference to what country they live in), we will see that the world of today is less unequal that it was 20 years ago. Why, then, do we keep being told that inequality is on the rise? 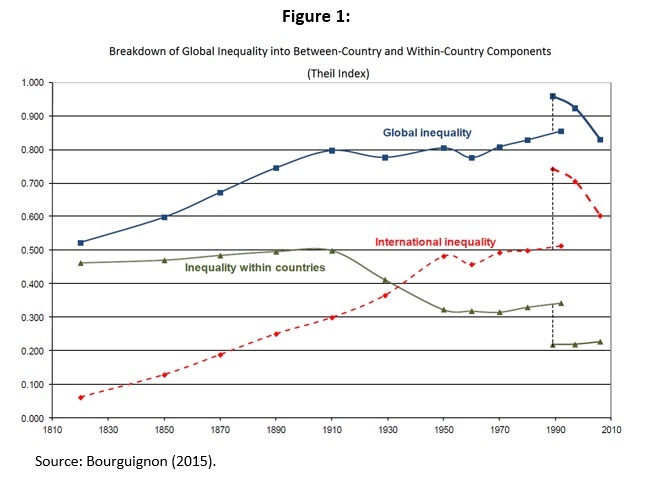 In order to answer that question, it is helpful to analyze the breakdown of global inequality into its between-country and within-country components. The between-country component of inequality is the degree of inequality that would exist if all the world’s inhabitants received the average income for the countries that they live in (i.e., not taking into account how income is distributed within each country). The within-country component corresponds to the average level of inequality existing in each country. Figure 1 shows the breakdown of the inter-country component (“International inequality”) and the intra-country component (“Inequality within countries”) of the Theil index of global inequality. Between-country inequality declined from 0.73 in 1990 to 0.479 in 2010, while within-country inequality rose from 0.22 to 0.24 during that period. Although that increase may seem small, around 20% of the decrease in between-country inequality has been offset by the increase in within-country inequality over the last decade. This overall increase masks the heterogeneity of the results, however. In some countries (such as the United States, a number of European countries and China), income inequality has risen sharply, while in others it has decreased. Thus, the reason why we so often hear that the world is becoming increasingly unequal is because that is what is happening in some of the countries that are at the center of the world stage. One of the reasons why many countries are becoming more unequal is the growth of the highest-income individuals’ share of total income, which is referred to as “top income inequality” (Atkinson et al., 2011). Advancements in communications technology and market expansion have made it easier for extremely talented and innovative individuals to become superstars who earn huge incomes that are far higher than those of the rest of the population. The increase in extreme inequality in some countries, especially the United States, a number of European countries and China, has prompted some economists to ask themselves whether the increase in within-country inequality has become an inherent feature of the twenty-first century globalization process and whether this type of inequality may come to overshadow between-country inequality as the main driving force behind upward trends in global inequality. This trend does not appear to be in evidence in Latin America, however. There, levels of inequality have descended in around half of the countries in recent years, and in those in which it has risen, it has done so less sharply than in other developing countries such as China. The question thus arises as to whether the increase in extreme inequality has been more moderate in Latin America. One of the constraints that researchers interested in studying extreme inequality must deal with is that the earnings of individuals with very high incomes are usually not reported in household surveys. In order to include these incomes in a comparison across countries over time, we therefore used the Billionaire Characteristics Database compiled by Caroline Freund and Sarah Oliver of the Peterson Institute of International Economics (Freund and Oliver, 2016). This database was constructed using the list of billionaires around the world that has been published each year by Forbes magazine since 1996. The database gives the following information on each billionaire: country of citizenship, net worth, company, sector of economic activity and a variable that indicates whether the person’s wealth was amassed by that person through his or her own efforts, was inherited or was derived from political connections. Today there are more than 1,800 billionaires with a total worth of over USD 7 trillion. 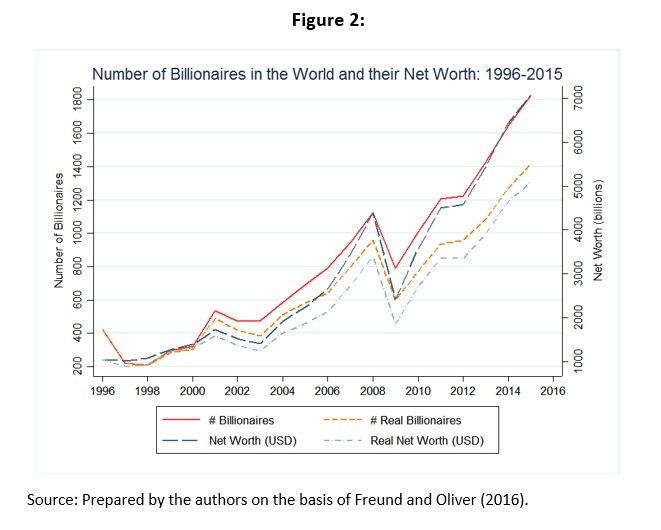 The number of billionaires in the world increased fourfold between 1996 and 2015, and their net worth (measured in constant 1996 dollars) increased fivefold (see Figure 2). Most billionaires and the greatest part of their collective net worth are concentrated in North America, Europe and East Asia (see Figure 3). There are only 101 billionaires in Latin America, and most of them live in Brazil (see Figure 4). Mexico used to be the country in the Latin American region with the largest number of billionaires, but Brazil took over the lead in 2006. Since then, the increase in the number of billionaires in the region has been accounted for almost entirely by Brazil. 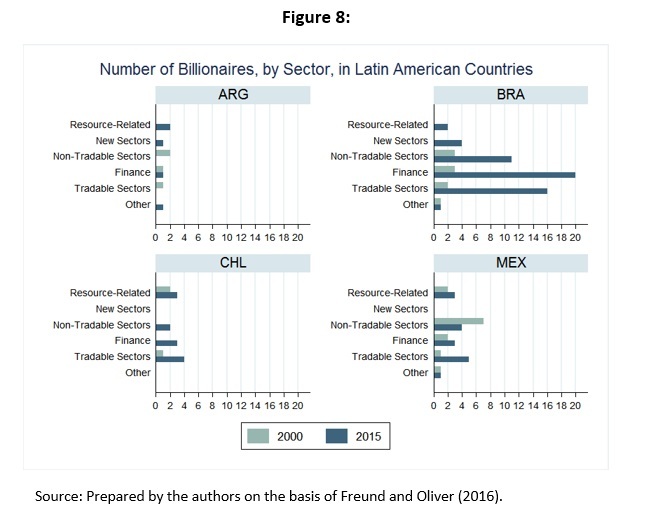 Nevertheless, the total net worth of Mexico’s billionaires is on a par with that of Brazil’s billionaires for the period under consideration (see Figure 5) because Mexico’s billionaires are, on average, the richest of all the billionaires in the region (around USD 9 billion as of 2015). 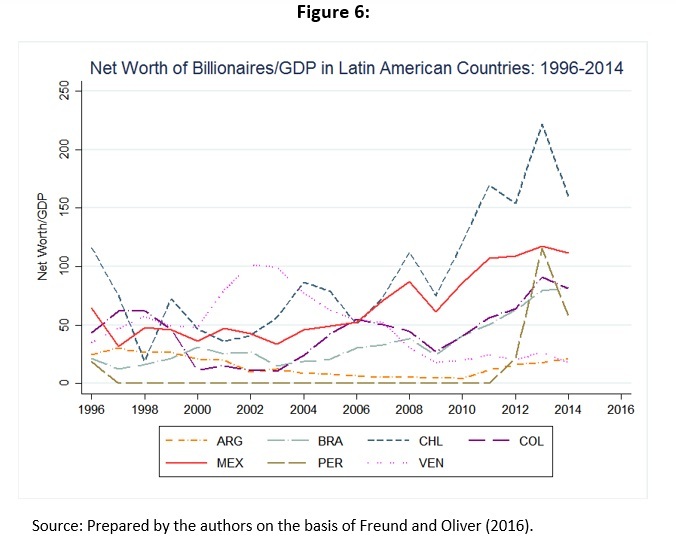 Yet even though Mexico has the richest billionaires in the region, Chile surpasses it in terms of the ratio between billionaires’ net worth and GDP (see Figure 6), with that ratio reaching over 200 in 2013. Why –with the exception of Brazil- has the number of billionaires risen so little in Latin America? One possible answer could have to do with the types of goods in which Latin America has comparative advantages. The region is competitive in the exports of natural resources, but that is not a sector in which superstars tend to arise. (We are currently working with Gustavo Torrens on this subject.) 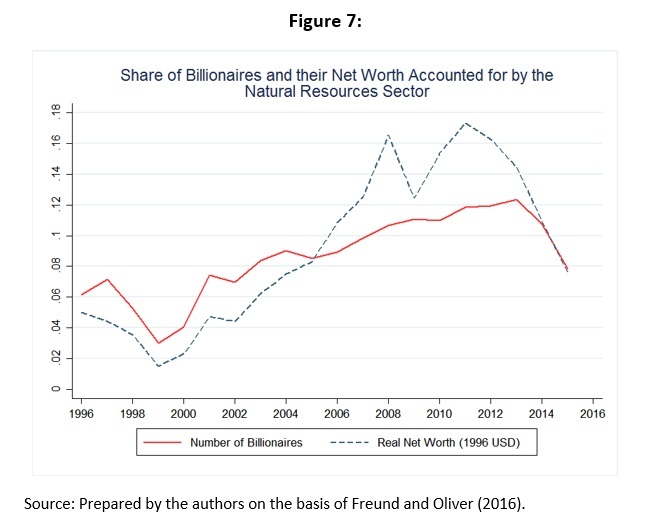 As is shown in Figure 7, the number and net worth of the world’s billionaires who have made their fortunes in the natural resources sector amounts to just 8% of the total, and this percentage has been shrinking in recent years. 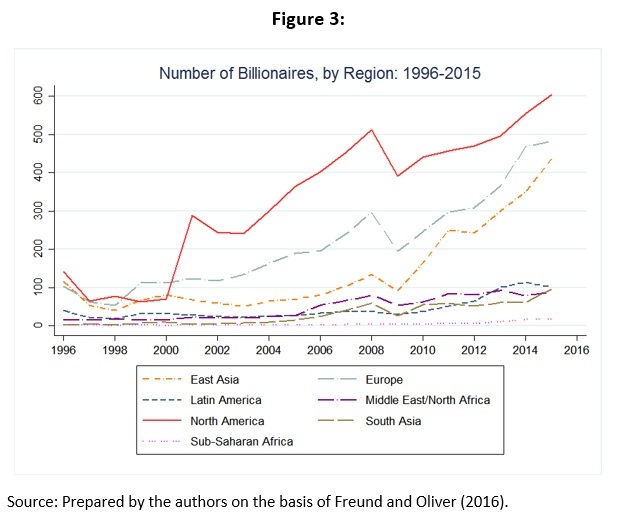 If we look at the four countries in the region with the most billionaires, we see that the growth in the number of billionaires is accounted for by other sectors of the economy that are more likely to serve as a breeding ground for superstars (see Figure 8). Of course, since the region does not have comparative advantages in those sectors, it is more difficult for them to generate a critical mass of highly successful entrepreneurs. 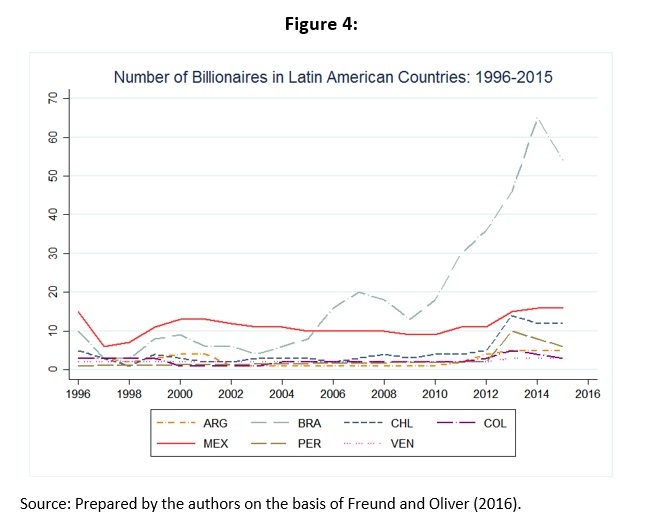 The obvious question that arises here is whether the fact that Latin America has not shared in the “billionaire boom” is a good thing or a bad thing. In her recent book, Caroline Freund (Freund, 2016) argues that the crucial factor in answering that question has to do with how those people’s wealth has been generated. If a majority of the billionaires in a given country have inherited their wealth or have obtained it through political connections, then they will tend to be lacking in dynamism and to exhibit little entrepreneurial spirit. If a majority of them are self-made men or women, then this is likely to be reflected in the existence of larger and more productive business enterprises – and those types of companies create more jobs, pay higher wages and spur the economy more than their more staid counterparts. The fact that Latin America –with the exception of Brazil- is not sharing in this boom of economic superstars may be a good thing in that the region is being spared the political problems associated with greater inequality in society, but it may also be symptomatic of a private sector’s inability to create highly productive firms. Atkinson, A. B., T. Piketty and E. Saez. 2011. “Top Incomes in the Long Run of History”. Journal of Economic Literature, 49 (1): 3–71. Bourguignon, F. 2015. The Globalization of Inequality. Princeton University Press. Bourguignon, F. and C. Morrisson. 2002. “Inequality among World Citizens: 1820–1992”. The American Economic Review, 92 (4): 727–744. Freund, C. 2016. Rich People Poor Countries: The Rise of Emerging-Market Tycoons and their Mega Firms. Peterson Institute for International Economics, 2016. Freund, C. and S. Oliver. 2016. The Origins of the Superrich: The Billionaire Characteristics Database. Peterson Institute for International Economics Working Paper 16-1.